Nickel aluminum bronze was developed for the USNavy atomic sub program. Was extremely strong when forged, resisted corrosion, etc. and was much much cheaper than Cu-Ni or Monel, CuNi and Monel being the BEST alloys vs. seawater. Im simply amazed that folks dont use zinc or zinc/magnesium anodes attached to their chains/anchors for long term mooring, etc. You need something less noble than the standard zinc galvanizing so the galvanizing doesnt become the primary sacrificial anode. Simple! I appreciate the idea of structural failure from galvanic and crevice corrosion of stainless steel. In fact, all materials have the "vulnerabilities" and limits. I am seriously curious to learn about the rate or number of stainless anchor gear failures. Is this documented? Hown does the insurance industry feel about this issue. They presumably have a vested interest in avoiding payouts for losses due to matereial failures. Do insurance policies every have exclusions for things like ss anchoring gear? There is not a failure rate that would rate 'serious concern', as yet. There are a lot more failures of steel. Look at any superboat, all stainless. If it were a problem it would not be there. There is a huge amount of Urban Myth with stainless and the same failures get used many many times. I would not have a problem using SS on an anchor system but I would bear its limitations in mind, just like most stuff. One limit being used in an extended underwater situation hence i probably would use steel on my extended crusier. Bimbling around back home here SS is fine. The 'as yet' comment above is due to the growing amount out of the east. This stuff can be good as anyone elses but usually is a lot worse. As more of this get used the failures will increase, same applies to steel. Richhh many do have anodes on mooring and anchor rodes. We actually make one spcifically for moorings. In some places it doubles the life of the mooring. Gord, taking to the AC and Volvo lads the problem with Titanium is it's brittleness. Just hate shock loads soooo much.... just like anything that high tensile inc. G70 chains. Damn strong and light but prone to cracking. The parts they use get replaced very often and/or x-rayed/tested a lot. Good to use in places but maintenance heavy and could let go without warning. Notice all the dramas the Volvo boats were having until they swapped the titanium back to Stainless. That's an interesting place Gord. Having a read of the paper and it look as if titanium should be better than 316 SS in a lot of things. Maybe all the guys having issues with Ti might need to speak to engineers and go up some sizes :-). One problem they were having lots of in using Ti in chainplates and things like that. They just suddenly let go. If Ti has good shock resistant properties it must be something else. Maybe a plain old simple 'did not build strong enough' issue, size for size SS is stronger. Intersting topic...I have a stainless anchor swivel (goes over my bow roller so nicely) and a stainless Bruce attached to galv BBB chain on my boat - weekending and vacation...I sail in freshwater - I suspect this makes a difference? Should I be on the lookout for problems? You shopuld always be inspecting ground tackle for problems, but fresh water certainly doens't have many of the issues Salt water produces. However, it also depends on how oxygenated your water is. If it ias good fresh water, you should be fine, but poor oxygen starved fresh water can be even worse than salt. Of course, most of us won't be sailing in dead lakes. there is a caveat which relates to the alkalinity or acidity of the mud in which your ancor lies. Who knows? Should the pH be close to neutral you will not suffer a problem. Merely because you are anchored in fresh water is no guarantee that the mud bottom is neutral. I think rich may be on the right track with the zink. In the past ten years I've worked on at least a dozen boats that have stainless running gear, struts rudders ect. , The oldest one was out for some work here recently and the struts looked like brand new that boat is almost thirty years old. Ive never herd of or seen a corrosion related failure in these types of boats but they all are zinked. 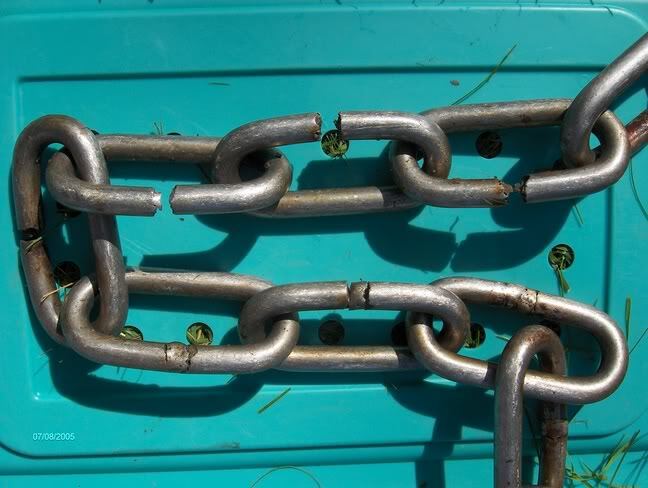 I remember that photo of the chain minus all the welds, And my first impression was some one welded 316L with 304 rod. I saw that on a hand railing once welds would not stay clean. And that brings me back to the other boats all that gear is built out of low carbon stainlees. So It may just be buyer beware, not all that glitters is gold. Make sure that high dollar part is built with low carbon. In my humble opinion - the BEST alloy to use above & below the waterline in UNOBTAINIUM... but it's very difficult to get. Here are those photo's you mentioned. Even though I have seen it before, it's still a big WOW!!! I can make out fine scratching on the chain links and with the grass I am assuming this was on a reasonably clean bottom like sandy and not thick mud. So oxygen starvation isn't the issue. As I said in an earlier post and this picture I think confirms it once again, this looks like a galvanic corrosion process, because those little weld pieces have simply dissolved away. 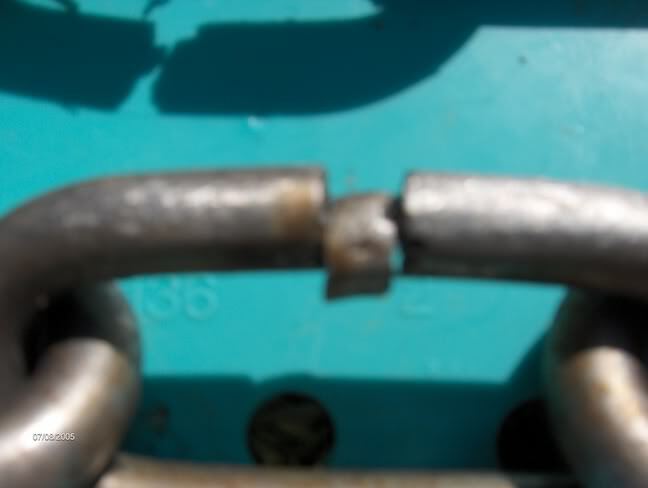 Interesting, bit hard to see with the chain so worn now, but I would almost like to guess the links have not been resistance welded together. It looks like a total filler. Which if there has been a carbonation problem in the weld, then that would set up this result. I've heard that when the military demand crashed in Russia they had to find other uses for titanium. You now find titanium shovels ,rakes and garden tools there. The Russian airline pilots are the contacts. Give them a sample of what you want and they can take it back to Russia and get a price for you. Titanium oil burner pots would be a good idea. Regarding the photos above. There is a case going on in Aussie at the moment where 2 blokes got killed on a government project when some SS chain let go. The report says the chain was made in the east and only 'welded' around the outside of the link i.e did not have any penatration. We sliced a few links here and found the same thing. Spooky.